The Trail Tamers are never “board” with the chance to repair a bridge, particularly a bridge like the one at the base of “Old Baldy” in McKinney Falls State Park in Austin. 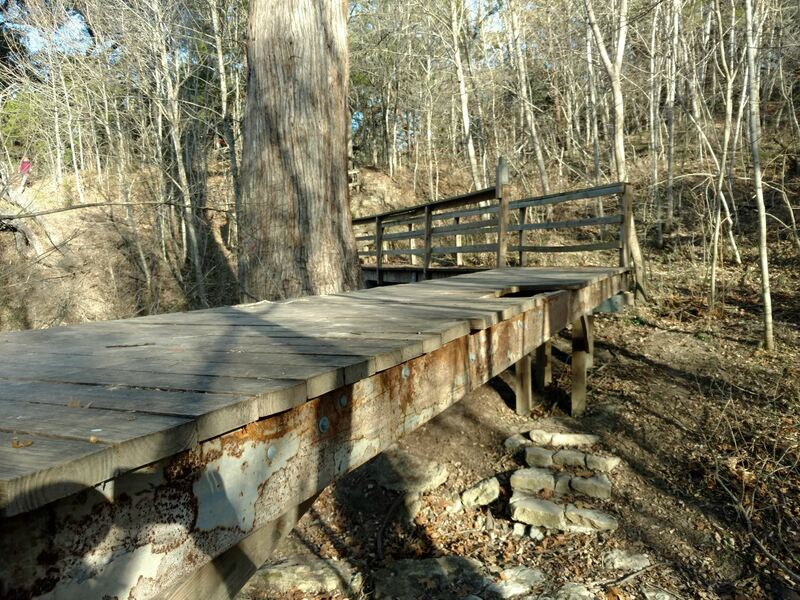 On January 21, the Trail Tamers will install new tread, replace hand rails and make other repairs on the Rock Shelter Trail bridge and nearby trail. We will need for you to bring your wood working tools; particularly those battery-operated drivers and saws and as many charged up batteries as you can afford.We could also use a few members to cook lunch and pull splinters out of the hands of the volunteers. Lunch will be provided. If we find a cook, it will be a hot lunch. "Old Baldy" is one of the oldest bald cypress trees on public land in Texas. Estimated at more than 500 years old, the tree is 103 feet tall. Its trunk measures 195 inches around, and its diameter is 60.5 inches.